A plaque commemorates those who served in World War Two with the 14th and 2nd Anti-Aircraft Batteries. 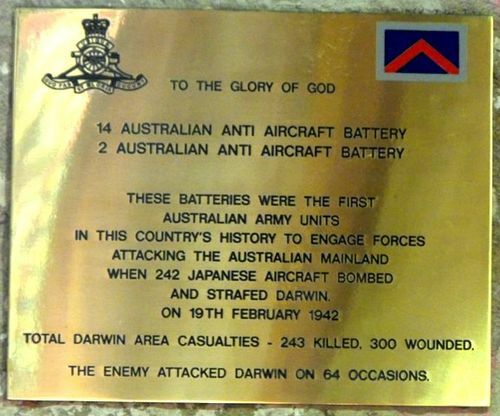 The 14th Heavy Anti-Aircraft Battery was one of the few Militia anti-aircraft units in Darwin at the time of the first raids by the Japanese during World War Two. The unit was equipped with both modern 3.7-inch anti-aircraft artillery and First World War–vintage Lewis light machine-guns. The enemy attacked Darwin on 64 occasions.